Crazy Diamond - A Tribute to Pink Floyd, has already been staged 120 times since its debut in 2008 at the Klein Karoo National Arts Festival. This electrifying multi-dimensional show received raving reviews during the past three years and hundreds of die-hard fans of the most successful rock bands of all time who attended the shows, were taken aback by the authentic sounds and captivating story. 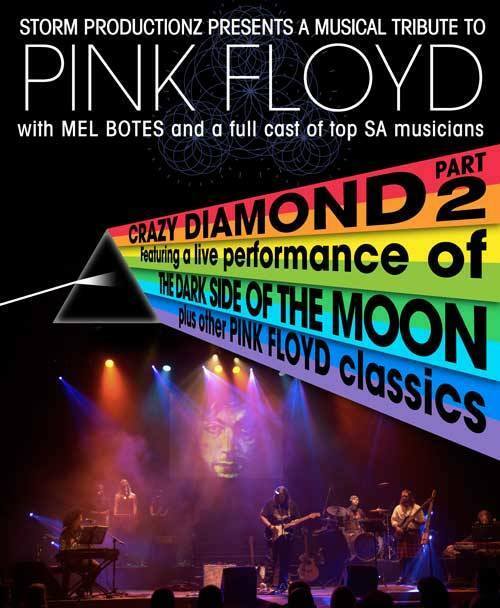 Pink Floyd, Crazy DiamondTaking centre stage in this production is Mel Botes, undoubtedly one of South Africas most talented guitarists and songwriters. His brilliance as guitar player has no limits in Crazy Diamond - A Tribute to Pink Floyd and swept music lovers off their feet. Crazy Diamond takes the audience on a scintillating two hour journey following the history of Pink Floyd, as seen through the eyes of Keith Barrett - aka Syd to his friends - and paying tribute to this master musician. Barrett was one of the founding members of Pink Floyd and even though he only stayed with the band for the first two years, his influence on the band continued long after the departure through their following 40 years or so existence. Audiences will feel electrified as they follow the Pink Floyd story which highlights Barretts influence he had on both the bands style of music and the lyrics they have written over the years. It also sheds light on the bands early influences; explains why their work often contains very long songs with elaborate free flowing solos and discusses their innovative use of modern technology and Musique concrete. Crazy Diamond covers a wide spectrum of Pink Floyds music and will soon have die-hard Floyd fans or just your regular rocker at heart enjoying the sounds of music ranging from the bands first album The Piper at the Gates of Dawn and continuing the journey through A Saucer Full of Secrets to the more modern Floyd music of The Wall to A Momentary Lapse of Reason and the last Pink Floyd album The Division Bell. Over 30 songs will be performed along this scintillating journey of rock at its very best, including Jugband Blues, Echoes, Speak to Me, Breathe, Happiest Days of our lives, Another Brick in the Wall, parts 1,2 and 3, The Dogs of War, Shine on You Crazy Diamond and many more, all ensuring the audiences will be provided with an ever to be forgotten show. Mel has always acknowledged that Pink Floyd has had a big influence on his music career, with their influence being evident in both his writing and style of playing and can be seen in Mels original works; Davids Confession and in Flight of Bird. Mel says This production has been a big challenge for me and a very valuable learning curve. Its been a wonderful opportunity to use everything Ive learned about playing music over 30 years to help me interpret Pink Floyds. Pink Floyd is known for its elaborate concerts with big budget lighting rigs, visual effects and sound systems, and Crazy Diamond pays tribute to these too. There are specially produced supporting images which are projected onto a screen and a voice over guides the audience through the years as the music takes them through the time-warp that as Pink Floyds music. The soundtrack of Crazy Diamond - A Tribute to Pink Floyd is also now available for the first time! The soundtrack was recorded live recently during the ten performances at the Victory Theatre in Johannesburg in 2010.